WARNING: THIS REVIEW IS NOTHING BUT WALL-TO-WALL SPOILERS! Well, I saw Knowing today, and as I write there is an extremely violent thunderstorm going on outside. I hope the power doesn't go out, because it's certainly an appropriate backdrop to express my thoughts on the film. I went into the film nursing a preconception, that this was some allegory of personal Gnostic revelation for John Koestler (a tribute to Arthur Koestler, author of The Roots of Coincidence), and that what I would be seeing would feed into this notion. I still see this film as highly symbolic and inherently Gnostic, but by no means pertaining to any individual's personal "awakening." I started to wonder if this is a metaphorical depiction of an ongoing - or oncoming - agenda, as it ties into so many strands of meaning I've been puzzling over for the past several years, and certainly since 9/11. Though I was surprised by how much I liked it, Knowing is derivative as hell. 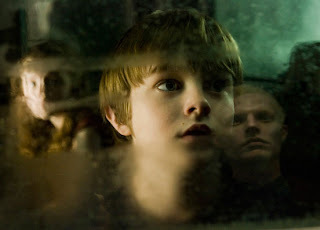 There is a scene where the Whisper People (the alien angels) show young Caleb Koestler (played by Chandler Canterbury, who also plays the young Benjamin Button) a vision of the oncoming solar apocalypse and it's nearly a shot-for-shot tribute to the alien apocalypse in The X-Files episode, "The Sixth Extinction: Amor Fati. " The ending of the film- where children are taken from Earth in order to seed a new world- reminded me of the alien Rapture in "Two Fathers/One Son," the mytharc episodes that preceded "The Sixth Extinction." Visually, the scene reminded me of the cult classic film, The Quiet Earth. The climax of the film recalls Deep Impact. And those of you who saw The Day the Earth Stood Still will pick up a lot of that vibe in Knowing, though it's a lot better than that preachy mess. Reviewers have compared the Whisper People to the Strangers in Dark City, but they reminded me more of the Friendly Man in The Forgotten (a film that was originally set in Boston). Knowing takes a lot of its ominous mood from The Forgotten, which itself borrowed liberally from The X-Files. At the end of the film the Whisper People morph from mopey goths to looking very much like the robots at the end of AI (but also reminded me of the light beings that Tracy Twyman mentioned in our first crossover). The plane crash scene is pretty tough to watch, and reminded me of two other Ten Thirteen milestones- "Tempus Fugit/Max" from the fourth season of The X-Files, and "The Innocents" from the third season of Millennium (which we looked at in the "Grill Flame") post. 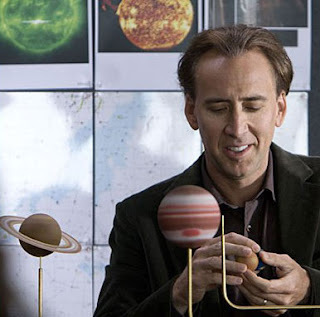 I was also struck on a personal level, seeing that the entire film takes place in my old neck of the woods, that being 42º latitude 71º longitude, which we see repeatedly on GPS. I did notice that my old hometown of Braintree was lit up like a Christmas tree in the satellite photos during the opening credits (I wonder how much of that was being generated by the monstrous South Shore Plaza, the mall where the exteriors for Paul Blart: Mall Cop were shot). The crash of the Plymouth Air jet seemed highly symbolic to me, since it was at Plymouth where corporatist Calvinism was imported into the New World (as were the Knowles family, incidentally). I've written about the strange, counter-intuitive syncs surrounding Plymouth and the Mayflower, and they certainly tied directly into this film. The subway disaster at Lafayette St (an obvious 9/11 allegory) claimed the lives of 170 people, not 81 (that was the plane crash). Check out Loren Coleman's post on Lafayette and "the Fayette factor" for deep background. And what's 17 without a 33? The last two disasters were predicted to claim 170 and 33 lives (although 33 wasn't quite accurate). Koestler's wife Allison died in a hotel fire in Phoenix. That's the kind of obvious sync we see when they are put in a film intentionally. Rose Byrne (Byrne=burn, more fire symbolism) is named Diana and dies in a car crash, as did her royal namesake, who was "England's Rose." Diana's identification with the Moon draws back to themes explored in Dark City- the lunar, monotheistic traditions battling the Solar, fertility ones. Interesting to note that Diana was going to disobey the aliens and take the children elsewhere, therefore opposing the Solar/alien revelation. Most of the action takes place in Lexington, where the American (read: Masonic) Revolution began. Lexington split off from Cambridge in 1713. When we meet Koestler's father, he is standing next to a very strange sculpture of a roaring lion, that looks very much like Aion (Deus Leontocephalus) from Mithraic iconography. Given the symbolic thrust of the film I don't think this is accidental. Since we are looking at Synchronicity, it should be noted that Aion was of particular importance to Carl Jung. 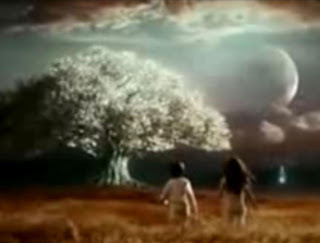 At the end of the film we see the children on their new alien world, merrily skipping through fields of grain with their white rabbits (la la la, everyone on Earth is dead, la la la). Since we're coming up on Easter, it's worth noting that rabbits or hares are sacred to the Magna Mater, whether you call her Eostre or Ishtar or Astarte or Inanna or Isis. More ancient fertility symbolism in sci-fi, where it shouldn't belong. 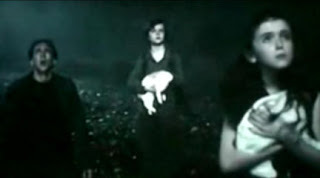 As others have noted, Caleb and Abigail (name on loan from National Treasure) run towards the Tree of Life, which we've been looking at in connection to ancient depicitions of the DNA helix. That entire tableau seems entirely symbolic to me. Since Sirius/Canis symbolism is becoming almost mandatory these days, it should be noted that Caleb also means "dog" in Hebrew. I couldn't help but remember that I had an ear infection when I had my leprechaun hallucination when I saw Caleb's hearing aid, which was a plot point in his own anomalous encounters. Exhibit A in Bible UFO literature- the wheels of Ezekiel- show up. Again, this ties into the "Sixth Extinction" storyline in The X-Files, since the quote was a linchpin when the AAT storyline was picked up again in "Providence/Provenance." So yet again, aliens at the multiplex. I was expecting this film to be an exploitative scare-a-thon, but the world destruction seemed entirely metaphorical to me. I've been puzzling over this strange nexus of Solar symbolism and alien revelation for quite some time now, and I'm still always stunned when I see it play out before my eyes on screen. Maybe more so than if I hadn't been aware of the history and importance of these memes. Although it's been reduced to a staid cartoon by scholars and opposition propagandists, the Solar religion is extremely complex, extremely symbolic and incredibly weird. I've been struggling with a post on Mithraism (that I hope to have up soon) that will prove just how alien - in the truest sense of the word- the Solar religions are. Last spring I began to suspect that the Sun in question is not our friendly old Sol, but an alien sun that some people throughout history have believed is of particular importance to human existence. The giveaway for the symbolic nature of the end of the world scenario was given away for me when Koestler (representing technocratic reductionist materialism) and his pastor father (representing corporate supernaturalism) embrace and then are consumed by the solar flare. It struck me that both our sciences and our religions would be absolutely devastated by alien contact, no matter how hard we may see the priests of these institutions back-peddling in the media lately. Not that they would be destroyed, but they would have to completely start from scratch, just as the biosphere would after the kind of inferno we see depicted in the film. So what does that mean today, when alien themes dominate in Hollywood like never before, UFO sightings are at an all-time high, and the Vatican and NASA are trying to figure out how humankind would respond to alien contact? This film could be pure fiction (in fact, let's just assume that it is, even though we've seen recent scare stories about solar activity), but if there was any truth behind all of the omens and portents we are all looking at, Knowing is throwing gasoline on this smoldering fire. But it's almost impossible for me to see this as a literal narrative, given the whimsical, soft-focus ending. Since solar symbolism and aliens seem to be so closely linked in movies, Knowing seems to tell us that large-scale contact would bring humanity to a standstill, and that only the very young would be able to fully adjust to the post-contact paradigm. All well and good, but why not just make that a movie? Why cloak these themes in a disaster movie scenario? That's the sort of thing that arouses my suspicions. But so does nearly everything we are seeing nowadays. Aliens and disasters are standard fare for big budget movies. But there's something about the way we're seeing these themes play out lately that really makes me wonder. 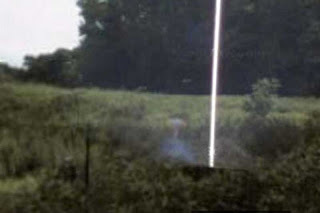 UPDATE: Speaking of aliens as beings of light, here's a much better shot of that NJ "alien' that showed up on Google Street View that I wrote about last week. Thanks to JR for the grabs.